What is Papyrus Software Designer? Papyrus designer is an extension of the UML Papyrus editor. It supports the software design by providing code generation from models including embedded and real-time systems as potential targets. In does this at two different levels of abstraction. Direct code generation for a specific programming language. Currently, C++ and Java are supported, C will be supported soon. The code generator also support reverse and roundtrip code generation. Adding a New Code Generator: Apart from the aforementioned programming language, it is also possible to develop and integrate other code generators to Papyrus. To learn about how to add a new code generator to Papyrus, refer to the following wikipage. Support for component-based models. In this case, the generation starts from a model that includes the definition of software components, hardware nodes and deployment information. The latter consists of a definition of the instances of components and nodes and an allocation between these. 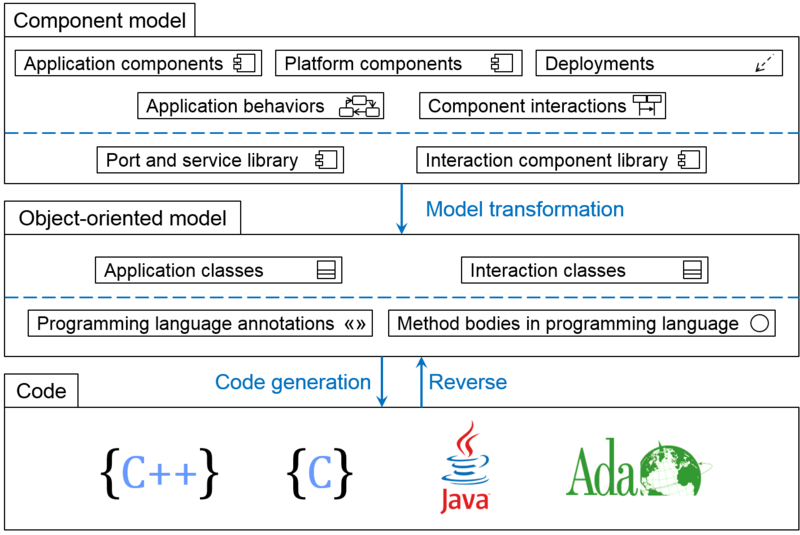 Code generation is done by a sequence of transformations steps. The model transformation takes care of some platform specific aspects (e.g. communication mechanisms or thread allocation), based on non-functional properties. This is complementary with the upcoming Papyrus architect that can create an allocation based on modeled analysis data such as period length or worst case execution times. Papyrus Software Designer is integrated into the open source UML editor Papyrus, The UML profile MARTE is used for non-functional properties. Parts of the component model were developed in the context of the French national project Flex-eWare. This page was last modified 10:30, 19 October 2016 by Shuai Li. Based on work by Ansgar Radermacher and Francois Le Fevre.